Women’s watches are elegant, they are useful, and they can say so much about the wearer’s style. Just because a woman’s watch can be timeless and classy, though, doesn’t mean she would have to take out a mortgage on her home to buy one. There are many watches for women at the top of today’s fashion that are still reasonably priced and we’ve got some great options to look at below. Our favorite out of this list encompasses complete elegance: The Raymond Weil Women’s “Noemia” Stainless Steel Watch. Check out our list of some of the best women’s watches under $2,000. What is the difference between a woman’s wristwatch and a man’s? Are watches more accessory or utilitarian? Raymond Weil’s Noemia Stainless Steel Watch provides a very strong and purposeful aesthetic with hints of beautifully delicate features. It is perfect for anyone who wants to exude style and power. The round watch has a 26mm stainless steel case and link bracelet. The white mother-of-pearl dial has silver-toned Roman numeral markers that accompany eight placed diamond hour markers. It is protected by an anti-reflective sapphire dial window. While that may sound like enough to have anyone begging for a look at your wrist, there’s more. The bezel is tastefully diamond-studded. This watch is an absolutely gorgeous piece that is durable and strong. Additionally, it is water resistant up to 165-feet so short periods of swimming shouldn’t be an issue. There do not seem to be many negatives that accompany this watch. It is a bit on the higher side so just make sure that it is the style you are looking for so that you get the most out of your purchase. 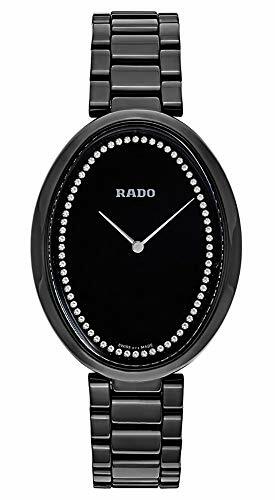 Rado is the definition of sleek and never more so than with its Rado Esenza Touch Jubile. This brand is famous for its innovative designs—especially with its use of ceramic. The case, band, and the bezel are ceramic, which is extremely durable and keeps the watch in incredible shape for a long time to come. Additionally, the window material is scratch-proof anti-reflective sapphire. The movement is Swiss quartz. It is an exquisite and high-quality watch but a couple of special features make the watch legendary. One of the features is its ceramic touch technology, with sensors in the case that sense the touch of the wearer and allows the watch to be set. The second is the 60 diamonds that surround the oval dial. This watch is made to impress. The ceramic durability and the diamond, sleek design makes this a very popular watch. This watch is not one to be missed. While that’s a good thing, it’s not conspicuous and you can’t wear it in every setting—especially casual ones. With it being on the pricey side, you must question whether you’ll wear this watch consistently enough to make it worth the price tag. Gucci needs no introduction when discussing elegant accessories and this G-Frame Mother of Pearl Dial Watch is one reason why. Its square case is 39mm in diameter and is stainless steel. The most distinct and stunning feature of this watch is its red and green-striped mother of pearl dial. The hands are silver-toned and the four, distinct markers are as well. Completed by a leather strap, this is a beautiful watch that can be worn in a myriad of settings. Made special by small touches, like the colorful dial and the silver-toned markers, this is a unique watch that will draw attention, yet fit into any situation. This analog watch has quartz movement, is Swiss made and is water resistant up to 165-feet. Being high-quality, it is a great investment for those who want a unique but beautiful watch. One of the only negatives is that it is on the expensive side. This Hamilton Women’s Stainless Steel watch is the definition of sophistication. This watch is the perfect accessory to dress up an outfit for a cocktail party while simple enough to go with almost anything. It has a stainless steel tonneau case with a snakeskin chain bracelet. The white dial is protected by a sapphire crystal window that has an anti-reflective coating. The most distinctive part of the watch is its clear blue hands, which add a pop of color. With a very small case and dial, this watch can give the appearance of a bracelet until the blue hands catch the eye. Favorite features of this watch include the easy-to-read numbers—despite the fact that the dial is so small and the fact that this watch is also a lot more durable and long-lasting than it appears. With limited negatives, it is important to remember that this watch is a bit smaller than some may prefer. With current trends pointing to larger cases, this watch may not be everyone’s cup of tea. Movados’s gorgeous Women’s Heritage Rose Gold Watch is not only elegant and durable, but it’s also a piece of art in itself with its unique subdial features. The case is rose gold ion-plated stainless steel and has a tasteful white leather strap, However, the focus of this watch is its dial. 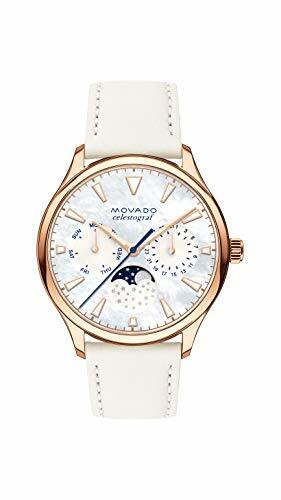 The dial is white mother-of-pearl with subdials that show the day, date and moon-phase. Additionally, the rose gold-tone hands and markers are easily visible and luminescent. The dial window material is sapphire crystal and the display is analog with Swiss quartz movement. Another great feature is that the watch is water resistant to 30 meters. Overall, this watch is perfect for anyone who wants something stylish but also very unique. With its rose gold tones and artistic features, Movado’s Heritage watch will draw attention and hint at a much larger price tag. The face is a bit smaller than the images tend to make it appear so make sure you’re happy with the stated size of the watch before purchasing. Sometimes it’s difficult to tell whether a watch is a woman’s watch or a man’s. The most distinguishing factor is that men’s watches tend to be larger and heavier. With men having larger wrist sizes, the strap is going to be heavier and wider. The dial circumference will also be larger. It is possible for women to wear men’s watches but a woman’s watch is made to fit more comfortably. Women’s watches generally have more subtle dials, too. Men’s watches are made to draw the eye to the watch while a woman’s watch is often meant to blend into the style of its wearer. Watches are whatever the wearer needs them to be…or at least that’s how it’s supposed to be. Many people work in careers where knowing the accurate time is vital. Others love the aesthetic a beautiful watch provides and its use as an accessory is the most important part of its existence. Whatever role you want a watch to serve, you can find the right one for you and often it can wear multiple hats. For example, a gorgeous piece that seems like an added part of a woman’s evening wear can often be durable and precise enough to accompany her the next day as she climbs a mountain. There are a lot of options for what you may need your watch for. Is it an accessory for a party or for your work outfit? Do you need it in order to do your job effectively? Will it be an everyday piece or an occasionally worn piece? Know what place you want a watch to have in your life and then decide if you can find one that falls in your budget. A watch can be quite an investment, depending on how much money you think your wrist’s future friend is worth. While the prices on this list are budgeted to under two thousand, that is still quite a chunk of money. 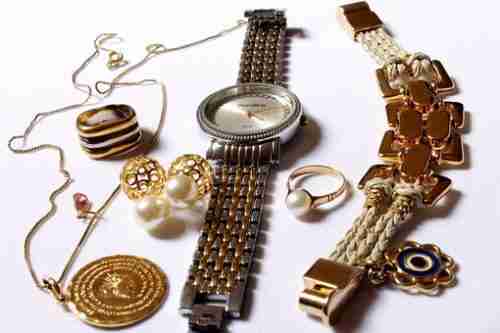 However, some accessories–like watches–grow in value over the years. But, it’s important to do your research before taking any risks and figure out whether the money you are investing will be worth it to you now and/or down the line. Investments must be thought out and considered carefully. Women’s watches, they’ve been around longer than most realize—Marie Antoinette commissioned one, as a matter of fact. As you can see, there are a lot of affordable and fashionable options for women’s watches that will not clean out your bank account. A woman’s watch can be a lovely accessory as well as a functional addition to your life. 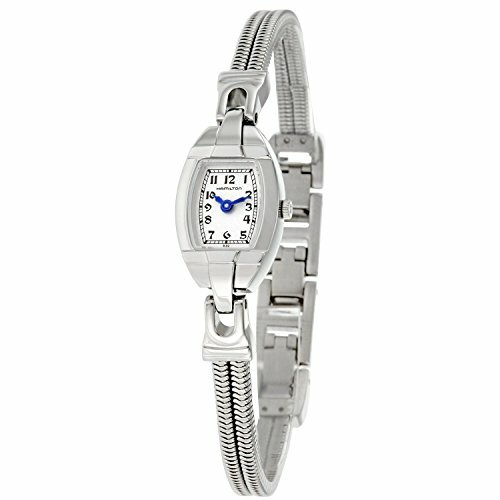 Again, our favorite option from this list of best Women’s Watches under $2000 is the ­­­­­­­­­­­­­­­­­­­Raymond Weil Women’s “Noemia” Stainless Steel Watch. It’s classy, adaptable for whatever occasion you may wear it for, and under $2000—what’s not to like? If that piece doesn’t coincide with your style, we hope you found another great watch on this list that does.